If you need some help choosing between WoodyKnows and SleepRight Nasal Breathe Aid, we are here to lend you a hand. Both brands of nasal dilators are quite successful in eliminating nasal obstructions that cause snoring, but they still differ in several important aspects. Our WoodyKnows VS SleepRight comparison can help you quickly discover what it is that sets them apart and what makes one of them a safer and wiser choice. WoodyKnows Nasal Dilator is an excellent snoring aid that easily fits into your nostrils and opens up your nasal passages. Apart from being soft, flexible, and ultra-thin, it is very comfortable and discrete. It is also suitable for children. WoodyKnows nasal dilator is reusable. A single dilator can be used for up to 30 days. You get 3 dilators per pack, so a single pack can last for 90 days. WoodyKnows nasal dilator is made of soft, flexible, and ultra-thin medical-grade plastic. The plastic is FDA-approved. The device is free from BPA, phthalates, drugs, and adhesives. WoodyKnows nasal dilator is not customizable in itself. Instead, it comes in three different sizes. You can opt for the small dilator (suitable for children and adults with small noses), medium-sized dilator, and large dilator, depending on your nose size. If you are not sure which size to choose, you can first order the trial pack including one dilator in each size. WoodyKnows nasal dilator is designed in accordance with the natural nostril shape, so it is comfortable and easy to get used to. However, it goes deeper into the nasal passage than many other dilators, so the adjustment period may take a couple of days. WoodyKnows nasal dilator gently opens up your nasal passages and goes deep inside your nostrils, thus allowing air to flow freely and eliminating nasal snoring. It has proved to be highly effective in snorers with deviated septums, snorers suffering from nasal congestion, and individuals whose snoring is caused by collapsed nasal valves. WoodyKnows nasal dilator requires everyday cleaning. After each use, you should clean the device using warm water and mild soap. Be gentle to the connector – if you break it, the dilator will be hard to remove after use. WoodyKnows nasal dilator has no known side effects. Nose snorers whose nostrils cannot be comfortably dilated to at least 11 mm. WoodyKnows nasal dilator is sold through Amazon.com. For information on refunds, please see Amazon’s refund policy. WoodyKnows nasal dilator does not come with a warranty. It took me about a week to get use to something being in my nose. It was very sore at times, so I use some petroleum jelly to ease the transition. The material itself is very fragile, so I need to replace them once a month on average. It's not perfect but it reduced my snoring to a degree and improved my nasal breathing, so I guess it's worth the money. I find these to be better than nasal vents. They just feel more natural in my nose. The material is not the softest but the dilators definitely work. Once I got used to these dilators (five to six nights, maybe even a whole week), I was really happy with them. They are very light and pretty efficient against snoring. This is a funny product. I snore a lot and it helps me a lot, but does nothing for my wife, I don’t know why. Personally, I recommend them. 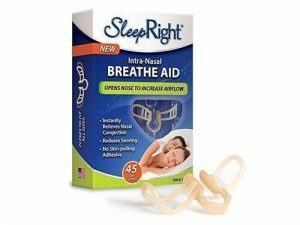 SleepRight nasal breathe aid is an intra-nasal anti-snoring device comprising nasal flares that prevent airflow obstruction and relieve nasal congestion. It is simple to use, rather affordable, and causes no irritations or skin blemishes.